The Oaks Aremisia Tiffany Ceiling Light Pendant Has A Geometric Tiffany Design Glass Shade Complimented With An Antique Finish Chain And Ceiling Rose Plate. The Interiors 1900 Astoria Tiffany Standard Lamp has an Art Deco design with dynamic lines in iridescent hues of purple, green, blue and black. The Interiors 1900 Astoria tiffany style floor uplighter is in an Art Deco design with dynamic lines. The Oaks Aztec Tiffany Ceiling Light Pendant is in vibrant colours and a bold design.. The Elstead Chastain Tiffany Table Lamp is part of the Quoizel Tiffany Collectibles family. The Elstead Classic Craftsman Tiffany Table Lamp is part of the Quoizel Tiffany Collectibles family. The Interiors 1900 Dark Star tiffany floor lamp is designed with iridescent black against pearly cream glass with an antique finish base. The Interiors 1900 Dark Star tiffany floor uplighter is designed with iridescent black against pearly cream glass with an antique finish base. The Interiors 1900 Dark Star tiffany flush ceiling light is designed with iridescent black against pearly cream glass. The Interiors 1900 Dark Star tiffany inverted ceiling light pendant is designed with iridescent black against pearly cream glass. The Interiors 1900 Dark Star tiffany large table lamp is designed with iridescent black against pearly cream glass with an antique finish base. The Interiors 1900 Dark Star tiffany semi flush ceiling light is designed with iridescent black against pearly cream glass. The Interiors 1900 Dark Star tiffany small table lamp is designed with iridescent black against pearly cream glass with an antique finish base. The Interiors 1900 Fargo tiffany bankers lamp is an elegant Art Deco style featuring clean lines and subtle muted colours with an antique finish base. The Interiors 1900 Fargo tiffany ceiling light pendant is an elegant Art Deco style featuring clean lines and subtle muted colours. The Interiors 1900 Fargo tiffany floor lamp is an elegant Art Deco style featuring clean lines and subtle muted colours with an antique finish base. The Interiors 1900 Fargo tiffany flush ceiling light is an elegant Art Deco style featuring clean lines and subtle muted colours. The Interiors 1900 Fargo tiffany medium globe ceiling light pendant is an elegant Art Deco style featuring clean lines and subtle muted colours. The Interiors 1900 Fargo tiffany small globe ceiling light pendant is an elegant Art Deco style featuring clean lines and subtle muted colours. The Interiors 1900 Fargo tiffany table lamp is an elegant Art Deco style featuring clean lines and subtle muted colours with an antique finish base. The Elstead Inglenook Tiffany Ceiling Light Pendant is part of the Quoizel Tiffany Collectibles family. The Elstead Inglenook Tiffany Standard Lamp is part of the Quoizel Tiffany Collectibles family. The Elstead Inglenook Tiffany Linear Ceiling Light Pendant is part of the Quoizel Tiffany Collectibles family. The Elstead Inglenook Tiffany Mini Pendant Ceiling Light is part of the Quoizel Tiffany Collectibles family. The Elstead Inglenook Tiffany Semi-Flush Ceiling Light is part of the Quoizel Tiffany Collectibles family. The Elstead Inglenook Tiffany Table Lamp is part of the Quoizel Tiffany Collectibles family. The Elstead Inglenook Tiffany Uplighter Ceiling Light is part of the Quoizel Tiffany Collectibles family. The Interiors 1900 Lloyd Tiffany ceiling light pendant is in an Art Deco design with bevelled glass beading and a bronze effect fitting. The Interiors 1900 Lloyd Tiffany standard lamp is in an Art Deco design with bevelled glass beading and an aluminium effect fitting. The Interiors 1900 Lloyd Tiffany standard lamp is in an Art Deco design with bevelled glass beading and a bronze effect fitting. The Interiors 1900 Lloyd Tiffany flush ceiling light is in an Art Deco design with bevelled glass beading and a bronze effect fitting. The Interiors 1900 Lloyd Tiffany inverted ceiling light pendant is in an Art Deco design with bevelled glass beading and a bronze effect fitting. The Interiors 1900 Lloyd Tiffany large ceiling light pendant is in an Art Deco design with bevelled glass beading and a polished aluminium effect fitting. The Interiors 1900 Lloyd Tiffany medium ceiling light pendant is in an Art Deco design with bevelled glass beading and a polished aluminium effect fitting. The Interiors 1900 Lloyd Tiffany table lamp is in an Art Deco design with bevelled glass beading and an aluminium effect fitting. The Interiors 1900 Lloyd Tiffany table lamp is in an Art Deco design with bevelled glass beading and a bronze effect fitting. The Interiors 1900 Metropolitan Tiffany large ceiling light pendant has black, white and grey Tiffany style glass on an aluminium effect fitting. The Interiors 1900 Metropolitan Tiffany medium ceiling light pendant has black, white and grey Tiffany style glass on an aluminium effect fitting. The Interiors 1900 Metropolitan Tiffany ceiling light pendant has black, white and grey Tiffany style glass on a bronze effect fitting. The Interiors 1900 Metropolitan Tiffany standard lamp has black, white and grey Tiffany style glass on an aluminium effect fitting. The Interiors 1900 Metropolitan Tiffany standard lamp has black, white and grey Tiffany style glass on a bronze effect fitting. The Interiors 1900 Metropolitan Tiffany flush ceiling light has black, white and grey Tiffany style glass on a bronze effect fitting. The Interiors 1900 Metropolitan Tiffany inverted ceiling light pendant has black, white and grey Tiffany style glass on a bronze effect fitting. The Interiors 1900 Metropolitan Tiffany table lamp has black, white and grey Tiffany style glass on an aluminium effect fitting. The Interiors 1900 Metropolitan Tiffany table lamp has black, white and grey Tiffany style glass on a bronze effect fitting. The Interiors 1900 Mission Tiffany floor lamp has clear and white Tiffany style glass with green highlights. The Interiors 1900 Mission Tiffany flush ceiling light has clear and white Tiffany style glass with green highlights. The Interiors 1900 Mission Tiffany large ceiling light pendant has clear and white Tiffany style glass with green highlights. The Interiors 1900 Mission Tiffany large inverted ceiling light pendant has clear and white Tiffany style glass with green highlights. The Interiors 1900 Mission Tiffany medium ceiling light pendant has clear and white Tiffany style glass with green highlights. The Interiors 1900 Mission Tiffany medium inverted ceiling light pendant has clear and white Tiffany style glass with green highlights. The Interiors 1900 Mission Tiffany table lamp has clear and white Tiffany style glass with green highlights. The Interiors 1900 Missori Tiffany ceiling light pendant has scalloped shaped glass sections in white and browns. The Interiors 1900 Missori Tiffany floor lamp has scalloped shaped glass sections in white and browns. The Interiors 1900 Missori Tiffany medium table lamp has scalloped shaped glass sections in white and browns. The Interiors 1900 Missori Tiffany small table lamp has scalloped shaped glass sections in white and browns. The Interiors 1900 Nevada Tiffany ceiling light pendant is inspired by the heat and golden sands of the Nevada desert. The Interiors 1900 Nevada Tiffany flush ceiling light is inspired by the heat and golden sands of the Nevada desert. The Interiors 1900 Nevada Tiffany medium table lamp is inspired by the heat and golden sands of the Nevada desert. The Interiors 1900 Nevada Tiffany small table lamp is inspired by the heat and golden sands of the Nevada desert. The Oaks Ophelia Large Tiffany Table Lamp has a square glass shade in a geometric design. The Oaks Ophelia TiffanyCeiling Light Lantern has a square glass shade in a geometric design. The Oaks Ophelia Large Tiffany Single Ceiling Light has a square glass shade in a geometric design. The Elstead Stephen Tiffany Ceiling Light Pendant is part of the Quoizel Tiffany Collectibles family. The Elstead Stephen Tiffany Mini pendant Ceiling Light is part of the Quoizel Tiffany Collectibles family. The Elstead Stephen Tiffany Table Lamp is part of the Quoizel Tiffany Collectibles family. 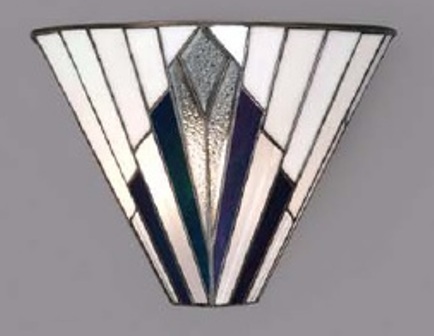 The Oaks Viola Tiffany Ceiling Light Pendant is in an Art Deco, geometric design. The Oaks Viola Tiffany Table Lamp is in an Art Deco, geometric design. Luxury Lighting supply a range of quality Art Deco Tiffany lights. Art Deco design is characterised by the use of geometric lines and bold contrast colours. Please browse our Art Deco Tiffany lighting collection where you will find ceiling lights, wall lights and table and floor lamps in stunning Art Deco styles to suit you.